I've spent many years exhibiting and curating group art exhibits (having my 9th annual curated exhibition at the 1310 Gallery July 15th), so nice to be invited to have a small solo exhibit at a wonderful and historic space. Honored for an opportunity to present at the Old Dillard Art Museum. The Old Dillard Museum provides enriching exhibitions and educational opportunities to keep Black History alive. The Old Dillard Museum occupies a prominent place in the history of Fort Lauderdale and has, over the years, presented educational opportunities for African-Americans as the first school constructed for people of color in this area. Formerly called "the colored school," Old Dillard was erected on land purchased from Ft. Lauderdale pioneers Frank and Ivy Stranahan for one dollar. If you are local, I do hope you will join me. Outside of the gallery's opening hours, there will be only two reception opportunities to see this exhibit. The emancipation of Niki Lopez. Solo art exhibit at the Old Dillard Museum. Niki Lopez will be presenting some of her latest works as well as art collective projects such as Artists For Black Lives Matter and What's Your Elephant. Lopez is a featured artist and one of the speakers at the Florida Emancipation Mini Fest. 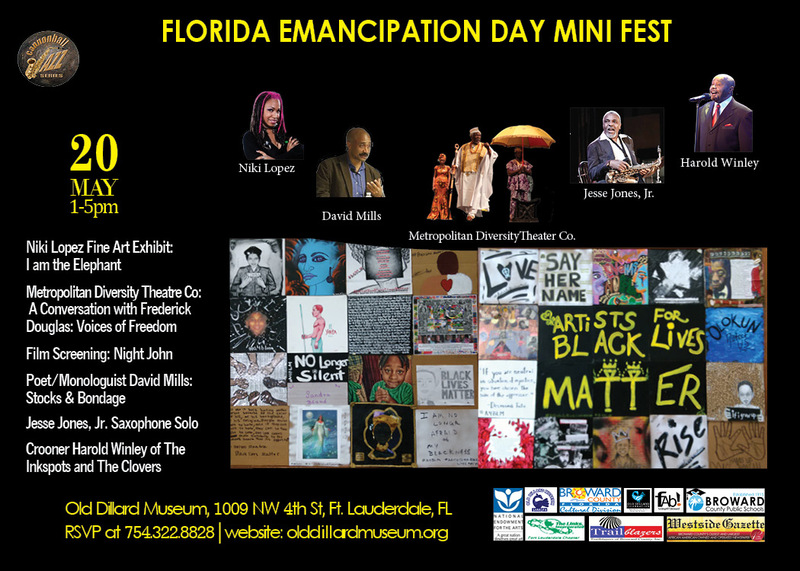 Celebrate Emancipation Day in a fun-filled, family friendly event that commemorates the struggles and triumphs of the African American people of the state. Featuring an art exhibition and discussion with Niki Lopez; Tony Thompson & The Metropolitan Diversity Theater Company; A screening of the film Night John; Poet/Monologuist David Mills; Saxophone Soloist Jesse Jones, Jr and Crooner Harold Winley of the Inkspots and the Clovers. Food and Arts and Crafts vendors will also be featured.